This Lenten season, for my sacrifice, I am swearing off beef, pork, chicken and lamb. For a certified "carnivore" like me, not having something like pork tocino or bacon or beef pinapaitan for breakfast, fried chicken for lunch and pork adobo for dinner is heartbreaking (drama!!!). Lucky for me I love dried, salted seafood like daing and tuyo. 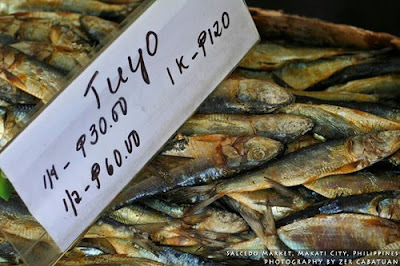 Tuyo (meaning dry) is fish that underwent salting and drying. These processes actually preserves the fish so that one can store it for some time. I think that tuyo is best served with rice, eggs and pork and beans but this morning I had just had two pieces of that delicious salted fish with a heaping serving of rice. Although I don't care much for the smell of tuyo frying, it really doesn't bother me unlike other people who find the smell unbearable. We still had a few pieces of tuyo left so I decided to add it to a pasta dish. The tuyo added a salty component to the dish and blended beautifully into the tomato based sauce. The pasta dish was satisfying and filling even if it didn't have meat in it. 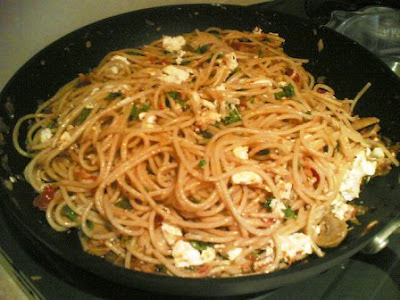 The addition of crumbly feta and some pasta water made the dish creamy. In a pan, heat olive oil and add chili flakes. Add onions and saute until soft. Add garlic, tomatoes, tuyo flakes, mushrooms and capers. Season with salt and pepper Saute until mushrooms are cooked. Toss in pasta, lemon zest and lemon juice and some pasta water. Add parsley and more pepper and salt,if needed). Crumble some feta cheese on top. Serve hot.